More space aliens and linguists! 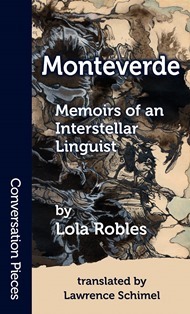 If you liked the movie Arrival, here’s another story about talking to aliens, Monteverde: Memoirs of an Interstellar Linguist, by Lola Robles, a Spanish author, translated by Lawrence Schimel. Lola writes outstanding, thoughtful works, and Lawrence is a talented and sensitive translator. Full disclosure: they're also friends. · More space aliens and linguists! This page was loaded Apr 24th 2019, 9:06 am GMT.